The Cantilever team loved participating as a Major Supplier for The Design File’s Open House in 2017. 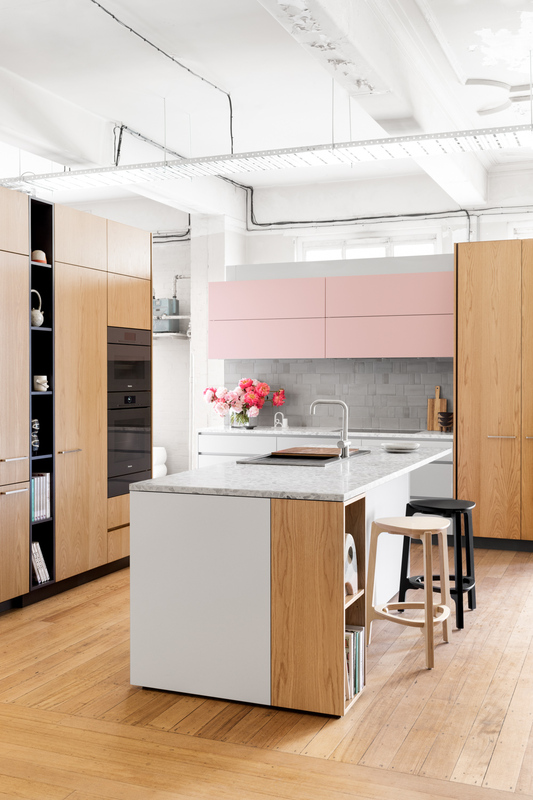 Approached by TDF to build a custom kitchen for the event, we worked with Lucy on a curated palette featuring soft Dulux tones in classic Cantilever finishes for a very special K2 edition. Cantilever has loved being a part of The Design File’s Open House event this year. Approached by TDF to build a custom kitchen for the event, we chose to work with the soft tones and smooth finishes of our K2 Kitchen System. Our premium system, the K2 is based on a strong palette combining Two Pack and Veneer with Stone benchtops and flush finger pull details. Two Pack is a durable and seamless finish that has endless colour flexibility, perfect for the Open House Dulux colour palette curated by TDF. Navigating the palette in blocks of colour, we used 'Dieskau' as the base cabinetry blocks, 'Friends' for a pop of colour in the upper and 'Chainmail' to accent the Open Mitred box amidst the tall block of Veneer. With an essential palette at hand, we sought a grounding presence, and looked to Anchor Ceramics. At Cantilever, we love a beautiful tile, and have fallen for Anchor’s contemporary take on the traditional subway tile. The 100 Series tile in a sage grey glaze was selected for the kitchen splashback. The subtle tones, satin finish and handmade textural surface harmonised with the materials palette curated for The Design Files Open House. The 100 Series tile is part of a range of tile formats and glaze finishes; available direct through the Anchor studio. True to K2 form, this Kitchen has all the trimmings, with Integrated appliances and hardware throughout, including Cantilever’s own Sink and Handles - designed by us and locally made. Seeking a tap of subtle distinction, we approached Sussex Taps to include the Voda Range in compliment to our Cantilever Sink product. Known for the precision and quality of their range, Sussex Taps have been manufacturing tapware in Melbourne for decades. The pursuit of excellence and sustained manufacturing knowledge of the company proved an inspiring match to our own company ethos of designing for longevity. Available in a variety of finishes, we chose to specify the Brushed Nickel finish for both the Voda Square and Curved taps on display at The Design Files Open House. With a mission to find a benchtop that would inspire conversation, we chose Signorino’s new release Terrazzo slabs in Bianco Neve, featuring large Carrara marble chips in white cement. Available in slab sizes adequate for most Kitchen benchtops, this material introduces colour without clutter. The inbuilt flexibility of our Kitchen Systems makes them highly adaptable to any scale or setting. Like every project – we began our design by gathering the details of the space, and working with the Appliance specifications to develop the best layout. As major partners to the event, Miele put forward their premium new range – The Artline Series. A refined set of handle-less appliances combine Oven, Steam Oven and Warming Drawer with Integrated Dishwasher, and Fridge. Alongside an Induction Cooktop and Integrated Rangehood, this Kitchen packs enormous cooking versatility and comfort into a modern footprint. 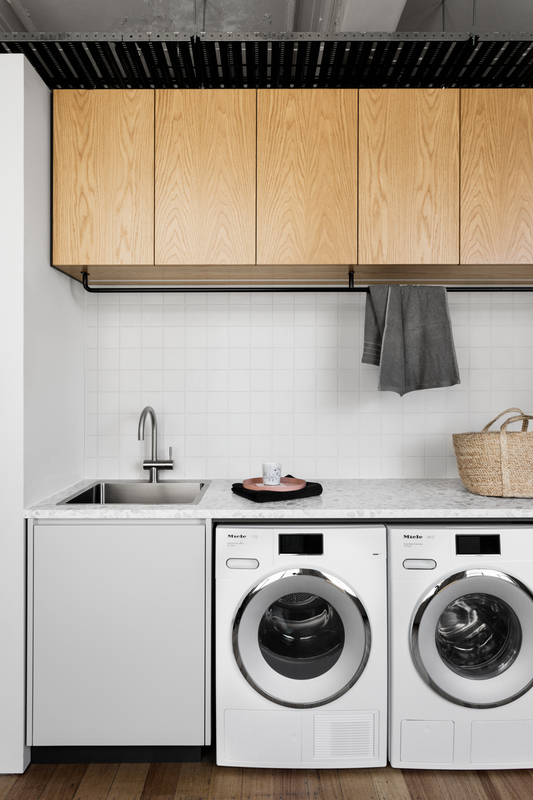 The Laundry setting showcases Cantilevers’ touch for joinery throughout the home - we often work on ‘Kitchen-plus’ projects – linking the palette and design detail of the Kitchen to any room in a home. We chose to feature Mutina Tiles sourced from Urban Edge Ceramics as a subtle compliment to the Terrazzo benchtop. Mutina is an Italian Ceramic design house with an incredible selection of products developed in collaboration with a dedicated group of designers. Inspired by the integrity and outcome of this research-led practice, we could not look past this brand as an inspiration for The Design Files Open House.